Hengelhoef Concrete Joints devised a unique solution to compensate for the shrinking of concrete in industrial floors: expansion joints with a sine and a cosine profile. In order to start with production, the company invested in plasma technology in combination with a cutting robot by FANUC. The previously usage of press for cutting was replaced by plasma technology, which eliminates the risk of deformation. Their second pressing plant with two FANUC robots will have paid for itself in just over a year. The talk amongst politicians may well be the talk of innovation but it is companies that have to put this into practice. One of those is located in Genk. Hengelhoef Concrete Joints devised a unique solution to compensate for the shrinking of concrete in industrial floors: expansion joints with a sine and a cosine profile. In order to start with production, the company invested in plasma technology in combination with a cutting robot by FANUC. Hengelhoef Concrete Joints (HCJ) was formed in 2007 as a spin-off from the adjoining Hengelhoef Workshops. CEO Albert Klingeleers says: “At the request of a customer we made an expansion joint. Expansion joints serve to accommodate the shrinkage of concrete. Prior to this, the overflow between concrete floor surfaces had cuts. That meant, however, that a new floor had to be damaged immediately. With a straight expansion joint, this is prevented, but there is still an impact every time a forklift drives over it. As a result, the hard wheels receive a lot of damage, but the goods transported, the driver and the floor itself is also affected by this. We therefore devised a solution by adjusting the profile of the expansion joint. Thanks to the sine form there is permanent contact between the wheels of the truck and the floor. You can still see the joint, but you will not feel it any more. The forklift can then move fully vibration-free, which doubles the life of the wheels and also prolongs the lifespan of the floor. What started as a concept soon became a series product and that did not fit within the scope of the workshops. After all, Workshops Hengelhoef are more orientated to deliver single pieces and customised services to local businesses, while we at HCJ offer a product that is export-oriented." There was also a second innovative product, approximating the shape of a cosine. “The sinus profile with a weight of 63 kg is difficult to manipulate. That is why we came up with the Cosine Slide with only half the weight”, adds managing director Dirk Meuwissen. “That makes the product much easier to handle, but slightly less stable”. So actually, it depends purely on the user’s preference, because both products have the same advantages and short return on investment.” These two patented products have world-wide success at present as unique solutions to a problem facing lots of industrial workshops. That also calls for additional efforts from the machinery. Meuwissen: “In the past, the products were cut in our press installation. That invariably led to a distortion that varied depending on the materials used. We therefore opted for the introduction of a cutting robot with plasma burner. Alternatives as saws and laser cutting fell by the wayside because of a product that was difficult to clamp and a technology that was too expensive. " Because HCJ already employs several FANUC welding robots to great satisfaction, the choice for a cutting robot was easily made. “The Arc Mate 0iB with the integrated FANUC iRVision system was the most suitable robot for this application. The products come from the press on a conveyor line to the robot. Therefore no manipulation is needed, they only perform a cut. The big challenge was always the exact positioning. This must be correct right down to the mm to deliver a quality product. The robot was equipped with a vision system that keeps an eye on all of that perfectly.” Because the maximum capacity had been reached, and to be able to accommodate the necessary growth over the next few years, HCI is currently investing in a second press plant. 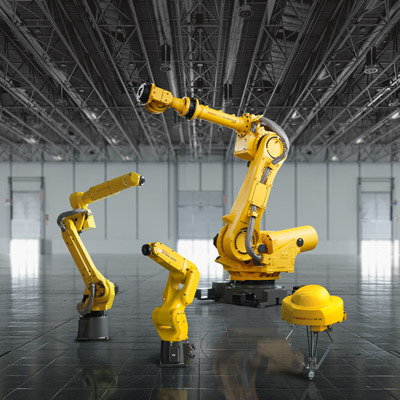 Two pieces may be fabricated simultaneously, requiring two more identical FANUC robots. “Automation is a must, if only to spare the backs of our employees. They handle heavy pieces. We see robots as a very affordable solution. The return on investment of this second plant will, for example, take a little over a year, because with it we can shorten the production time quite a lot. However, they cannot fully replace the shortage of skilled employees, because, to be able to work with the robots, you have to be technically proficient. And we would like to keep all that talent in-house so that it is easier to make our own parts and machines. So that makes it a little more difficult for your competition”, concludes Meuwissen.